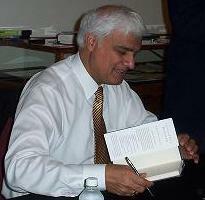 Last night I was listening to Ravi Zacharias on our local Christian radio station. Part of his presentation astounded me because I had never heard about it before. I used to be nearly obsessed with following the news. Over the years I have become less interested, though I still like to listen to CBC Radio and check out items flagged by others. But the fact that Ravi presented was so important, so wonderful, so loudly screaming of God at work that I cannot believe I have heard nothing about it until now. While in a prison in Miami Manuel Noriega found Christ! Maybe you know and I am just showing what happens to those of us who don’t have TV and can’t afford a daily newspaper. Several stories that illustrate his transformation were offered. The one that struck me came from a former prison guard who described how Noriega prevented a prisoner uprising on a bus transferring prisoners. Yes, as president of Panama General Noriega did some terrible things, but “The Lord isn’t slow to do what he promised, as some people think. Rather, he is patient for your sake. He doesn’t want to destroy anyone but wants all people to have an opportunity to turn to him and change the way they think and act” (2 Peter 3:9 God’s Word ©). “Then Jesus said to Zacchaeus, ‘You and your family have been saved today. You’ve shown that you, too, are one of Abraham’s descendants. Indeed, the Son of Man has come to seek and to save people who are lost” (Luke 19:9-10 God’s Word ©). I rejoice that the compassionate kindness of God shows no partiality. Anyone can be the somebody God saves. Now I feel better that this news was unknown to others, but it begs the question of where do we find news for Christians and the working of God? Yes, I would have been skeptical except there was a lot of evidence. God’s love knows no bounds. Yes, it seems impossible, yet that is the arena God works in – our impossible is God’s probable! You have company…I did not know this. Wow. I also had heard of Noriega, and I am truly awed by God’s grace if this man is now saved! That’s pretty amazing, I hadn’t heard about this either! (been a while since I’ve listened to Ravi too, but he’s great, used to listen to him all the time….) Praise God we’ll be able to spend eternity with our bro Manuel….